The Zscaler ThreatLabZ team has been tracking the Magecart campaign for several months. Magecart is a notorious hacker group that has been responsible for large attacks on the e-commerce sites of well-known brands, and we have continued to see its activity during this past month. In this blog, we will examine this campaign’s recent activity and its methods for skimming credit and debit card information for financial gain. As shown in the image below, this script tries to steal financial and personal information from the form input elements of the target site, and sends the collected information back to the attacker-controlled site. The domain used by the attacker to host malicious scripts and receive stolen information was registered in early September 2018. This newly registered domain is part of a trend we are seeing that minimizes the attacker's chances of getting blocked based on reputation engines, as the site is too new to have a low rating. Fun fact: the attacker also listed this domain for sale. Below are hits we have seen from MageCart campaign in past month. Although this campaign is not new, we continue to see newer domains being leveraged and additional e-commerce sites being impacted on a regular basis. Scripts used in the new and previous campaigns are similar; both domains are hosted on AS24936 Moscow, and may involve the same actor. 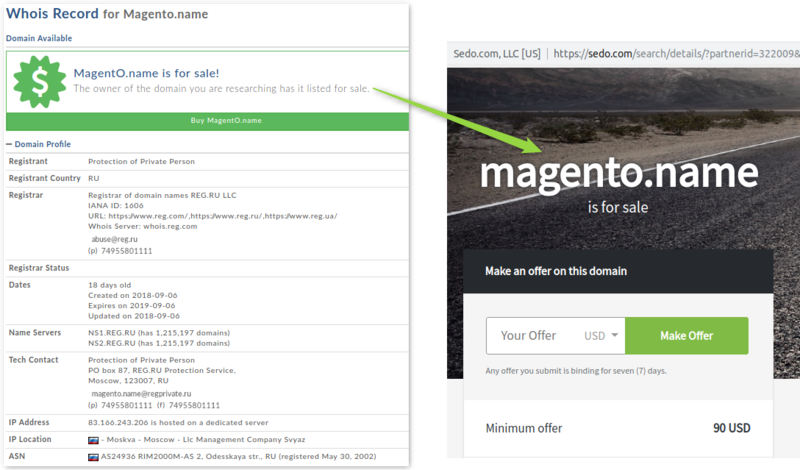 Sites compromised by Magecart can easily be searched from publicly available data (PublicWWW and Censys.io). Although magentacore[. ]net is not responding at the moment, infected domains/URLs can be searched on PublicWWW. Compromised sites seen recently by ThreatLabZ can be found here. Attackers are increasingly creative in their methods for generating income, whether through cryptomining, fake tech support scams, or, as in the case of Magecart campaigns, skimming for credit and debit card information. Magecart has been responsible for large-scale attacks on well-known brands, and the ThreatLabZ team will continue to monitor its activities to ensure coverage for Zscaler customers.